In a symbolic painting, Raphael, himself one of these immortal “naive” ones, has represented for us this demotion of appearance to the level of mere appearance, the primitive process of the naive artist and of Apollinian culture. 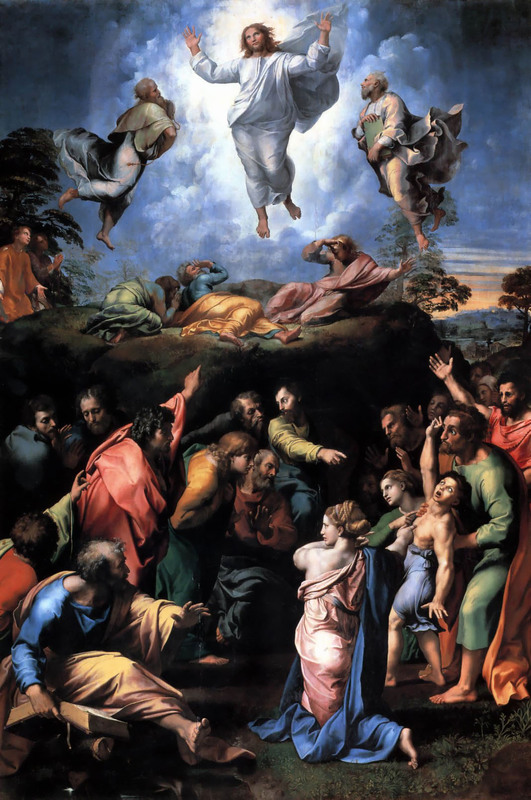 In his Transfiguration the lower half of the picture, with the possessed boy, the despairing bearers, the bewildered, terrified disciples, shows us the reflection of suffering, primal and eternal, the sole ground of the world: the “mere appearance” here is the reflection of eternal contradition, the father of things. From this mere appearance arises, like ambrosial vapor, a new visionary world of mere appearances, invisible to those wrapped in the first appearance–a radiant floating in purest bliss, a serene contemplation beaming from wide-open eyes. Here was have presented, in the most sublime artistic symbolism, that Apollinian world of beauty and its substratum, the terrible wisdom of Silenus; and intuitively we comprehend their necessary interdependence.